The Trillium Hospice House quilt project began nearly a year ago with a commitment by Nancy Henderson, an area quilter who volunteered to make a wall quilt for the Meditation Room of the new home. Shortly thereafter, Nancy was contacted by another quilter whose mother was a resident of a large hospice home in the Ann Arbor area which was decorated with many beautiful quilts. She too wished to make a quilt for the Trillium House. After discussions with other quilt friends, Nancy met with Pat Bray the executive director of Trillium House to develop a plan for incorporating more quilts in the new facility. 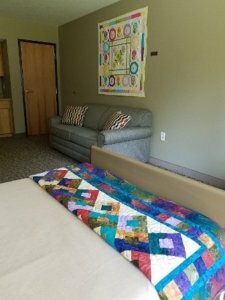 With a plan in place, the idea was presented to the Marquette County Quilters’ Association and several members eagerly volunteered to make a quilt for each of the eight resident rooms as well as several others for common areas throughout the building. 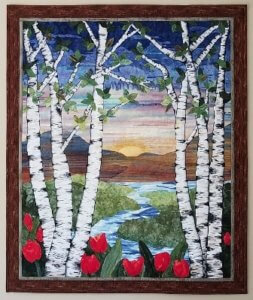 A total of 13 beautiful wall quilts were unveiled at the Trillium Open House in late June. The makers of these quilts are: Jane Vandenburg, Betty Jo Locicero, Esther Johnson, Tracey Cairati, Chris Wiik, Bev Hill, Judy Parlato, Chris Swenor, Alice Johnson, Teresa Zielinski and Nancy Henderson. 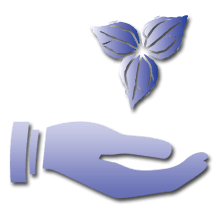 Shortly after the wall quilt project was started, MCQA voted to adopt the Trillium House as an ongoing charity. The quilt project then grew and the second phase involved making bed quilts for each room. These quilts are folded on the end of each bed and may be used by the resident or their loved ones during their stay. Prior to opening, MCQA members presented Trillium with 16 completed quilts. The members of the guild will provide more bed quilts as needed in the months and years to come.